Beautiful granite counter tops are available at Stonecrafters near McHenry in a variety of naturally occurring colors and patterns. Because we are a fabricator of granite kitchen countertops, we can achieve perfection in even the most complex kitchen designs. Our highly trained field measurement and estimate specialist will ensure that your granite counter tops fit exactly and are customized to your specifications. Custom Stonecrafters granite counter tops offer an excellent return on investment for years to come. Along the majestic Fox River, just 55 miles from Chicago and surrounded by natural lakes and streams, is the beautiful city of McHenry. 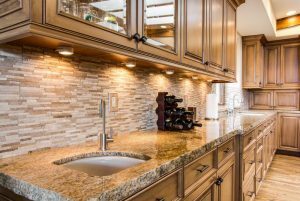 When the nearly 27,000 residents of McHenry need granite kitchen countertops from a reliable and reputable source, the one they call is Stonecrafters! We have the equipment and experience to deliver superior artistry at competitive rates. We guarantee our work and our customer service is top rated in the granite counter tops industry. Come see the difference at Stonecrafters! Customization in the granite counter tops industry is the name of the game, and you will be pleasantly surprised with our concepts at Stonecrafters. We have some of the most creative designs on the market. We look forward to working with our McHenry customers to make them a custom original design that matches not only their kitchen’s unique layout but will match their style and taste. For over 20 years, we have provided the quality craft and customized granite kitchen countertops to our customer’s satisfaction. Give Stonecrafters a call today at (815) 363-8730!